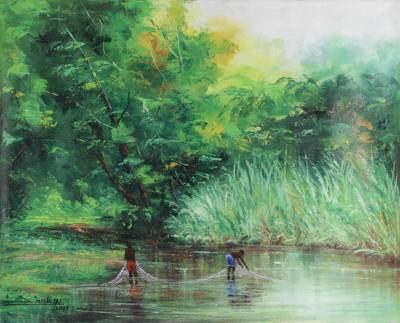 Signed Impressionist Painting of Two Fishermen from Ghana, "Fishermen"
Presenting a view of daily life in Africa, Ghanaian artist Bright Dankyi Mensah paints this view of two fishermen working together in the river. The artist paints in an impressionist style, using hues of green to capture the calmness of nature. "I schooled to gain broader knowledge in order to be more professional in my field of work and to share to my views and opinions with the whole world through my paintings." Bright Dankyi Mensah was born near Accra in 1978. The first born of Mr. and Mrs. Dankyi, he exhibited signs of artistic talent at an early age. After finishing secondary school in 1994, he went on to a technical school. In 1997, he entered the prestigious Ghanatta College of Art and Design where he was awarded a diploma in fine art. "I schooled to gain broader knowledge in order to be more professional in my field of work and to share to my views and opinions with the whole world through my paintings," he says. He exhibited his work at the Pan African Festivals in Legon in 2003. I just received an extraordinary painting entitled ""Different Faces"" by Bright Dankyi Mensah. The sweeping strokes and bold colors used by the artist, breathes life into the canvas. This painting has definately got to be one of my favorites. It is a honor for me to add such a vibrant piece to my collection. Mr. Mensah exhibits such creativity and skill. I know you will be impressed and pleased with any of Mr. Mensah's works.